No other word to describe it... I even missed posting about E's SIXTEENTH birthday. What mom DOES that? Sixteen... crazy! And what a beautiful sixteen she is! She is beautiful on the inside and outside! She loves her family, she loves her friends, and she just loves life! And nothing makes me happier than her random "just because" hugs! Gotta love that! Here she is on the banks of St. Thomas showing the world! Guess that leads into why we were in St. Thomas... My beautiful in-laws took us on an NCL cruise over Thanksgiving for our Christmas present! 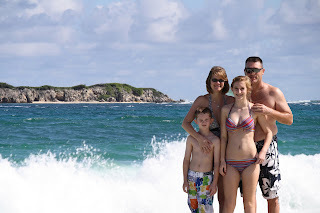 It was gorgeous... stops in St. Maartin (below Christmas card photo), St. Thomas, and the Bahamas. What a great way to spend time with family. We are blessed! Then there is Pinterest! Pure evil, and I love it! Gone a little crazy with pinning and creating, but a great stress reliever and makes the house purty as well! Here are a few things I have created thanks to the fun site! T's teacher gifts - dry erase boards using a normal frame, scrapbook paper, and I eventually attached the pens. Trust me, they work! Santa Bellies - holiday tradition is to make my cards and an annual ornament. Didn't get the cards made this year (did photo cards), but made these... Jute - don't sit still for too long... you might be covered in jute! Love the way this took old things and made them look classy. From our family to yours... Hope this new year finds you as happy and healthy as can be! Love us!